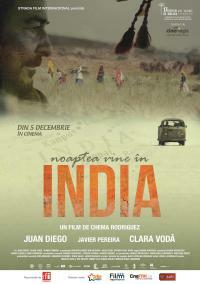 "Nightfall in India", in cinemas from December 5th! Ricardo (Juan Diego) is in a wheelchair for 10 years and wants to die on the shore of the Ganges and to meet again Gadhali, the love of his life. Dana (Clara Vodă) will be along on this journey throughEurope, Turkey, Iran and Pakistan. Both have high expectations from this road. The film won two important awards at Malaga International Film Festival - Best Actor (Juan Diego) and Best Editing (José M. G. Moyano). "When somebody asks me about the genre of Nightfall in India, I don't know quite well what to reply. Perhaps it's an adventure drama with touches of comedy, or a dramatic comedy in the context of an initiation adventure. "- Chema Rodriguez Ricardo's adventure and the character itself are based on a real person and on a book published by Chema Rodriguez about his story in 2003. He is called Lorenzo del Amo, and the book, Night Falls in Kathmandu. Lorenzo lived in India in the 70s and there he met Adinda, the woman who inspires the "ghost" character of Gadhali. He spent the happiest years of his life with her until she left him for a North-American who had more money and was less of a hippy than Lorenzo. Back in Europe, Lorenzo bought a van and started a travel business, bringing people first to the East and later to Africa. There, while swimming in the Niger River, he had an accident and became paraplegic. Since then, he is dreaming about going back to India some day. Clara Voda is a gorgeous actress (then I also knew she's an incredibly sensitive human being), and once I saw her performance in "If I want to whistle, I whistle", I knew she should be Dana. I really wanted her to be Dana. The same as I wanted Juan Diego to be Ricardo, from the very beginning, Clara was my first and only option for Dana. The hues in her performance and her ability to convey feelings in such a natural way, also without speaking, only with her eyes and her expression... Then, I also saw other films in her filmography, and it's been a huge pleasure to have been able to work with her. Her performance in "Nightfall in India", where she has a leading role, is brilliant. The film couldn't have been done without her. "Nightfall in India" is Chema Rodriguez's first feature film, after he made 50 documentaries for television and 3 cinema documentaries. The film was shot in Romania (Strada Film), Turkey, Spain and India. "It was exciting to shoot a part of "Nightfall in India" in Bucharest, so I got to know many talented people. I really like contemporary Romanian cinema, admire the young generation of Romanian filmmakers (Mitulescu Catalin Florin Serban, Cristi Puiu, Cristian Mungiu etc.)" - Chema Rodriguez. The film will run from December 5th at The New Cinema of the Romanian Director, being distributed by Strada Film International.